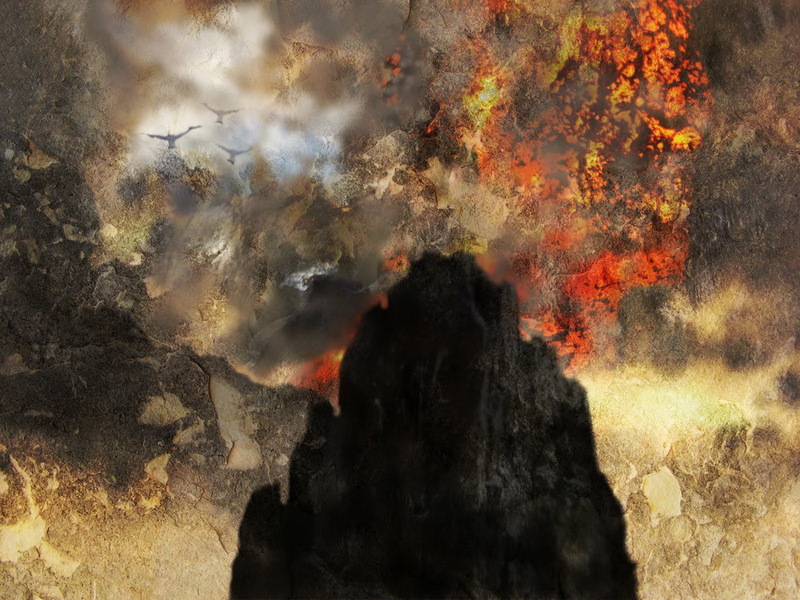 For the Anniversary of the Fall of Barad-dûr: two poems by jan-u-wine, art by John Cockshaw. ~ Detail from The End of All Things: Rescue by Gandalf and the Eagles, by John Cockshaw. This March 25 we present something old, something new. Below the image of Frodo standing at the Cracks of Doom is something old: a poem jan-u-wine wrote years ago, but which I had never read. The Turning of the Road: The Sammath Naur distills events from that last day, letting us see into the heart of Frodo's experience as he is overpowered and nearly destroyed by Sauron, his life, sanity and the fate of Middle-earth preserved only by the madness of Gollum and the love of Samwise. Below the first poem and an excerpt from Return of the King, is an illustration by John Cockshaw showing the coming of Gandalf and the Eagles, chosen to complement the "something new": jan-u-wine's Cast Up, which follows. The new poem lifts up and makes explicit the hope that is only hinted at in the darker Turning, bearing Frodo, Sam and us readers out of downfall and despair. It is a small thing. Frodo and Sam could go no further. Their last strength of mind and body was swiftly ebbing. They had reached a low ashen hill piled at the Mountain’s foot; but from it there was no more escape. It was an island now, not long to endure, amid the torment of Orodruin. All about it the earth gaped, and from deep rifts and pits smoke and fumes leaped up. Behind them the Mountain was convulsed. Great rents opened in its side. Slow rivers of fire came down the long slopes towards them. Soon they would be engulfed. A rain of hot ash was falling. the place where we must end. it would ring out in this terrible place. tenderly borne to its rest. to ride within this claw-cradle? The wonder and beauty of it. I am falling towards sleep again. The picture for this post, "The End of All Things: Rescue by Gandalf and the Eagles", was created by John Cockshaw, a Tolkien artist from Yorkshire, UK. I first found his pictures searching for illustrations for last year’s March 25 post. You will hear John Cockshaw beautifully read excerpts from jan-u-wine's poems, his images shifting as he reads, while music plays that plucks at memory. Truly, it's a beautiful two minutes. 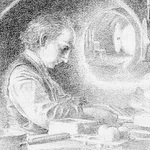 The Cockshaw piece used for this post, like much of the work featured in his blog, shows a scene from Tolkien's tale created digitally, using photographic elements. Mr. Cockshaw is also a talented freehand artist. 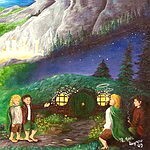 Visit his website and browse: From Mordor to the Misty Mountains: Original artwork inspired by the tales of Middle-earth . ~ Happy [Late] Birthday, Bagginses 2014, "Birthday" by jan-u-wine, art by Alan Lee. I am in awe. Best wishes on your venture, Jan. It's really beautiful. Thanks for sharing with us, Mechtild. thank you so much, Prim. It is an honor to work with John, who has so selflessly shared his (he)art, his time, his wonderful skill. And it has been my pleasure to work (although it has never seemed thus) with Mechtild for.....well, how many years, now? Going on ten, I think. There has been so much inspiration from the dialogue I've shared with other fans, so much insight that would never have come to me without so many wonderful conversations. So.....thanks to all of you, from my heart! Just beyond lovely as always. Thank you so much!! Happy Ring Day!! Praise them with great praise!! So pleased you could stop by, Rakshi, and so pleased you liked the pieces!! Yes, Harry Ring Day (or "Happy NO Ring Day", ha ha)! Here from primula_baggins. This is lovely and the reading of Jan's poem is beautiful. thank you so much, Addie. It makes me so happy that people love to visit Middle Earth! A beautiful three part jointing here. The first poem is so sad and horrific of what the book only hinted at. The second bittersweet and so interesting that he hears the sea among the flames--but of course that would come back along with the thoughts of home. And that seeing the eagles would bring Frodo back to Bilbo's tale, just as it brings the reader, but back to Frodo's childhood, too. Holding onto the beauty and not sinking with the horror does not last for long, but he gets that moment of rest. What a lovely voice John Cockshaw brings for your Frodo, Jan. Beautiful bittersweet video production. I can't wait to buy the book. and, yes, John has a beautiful, lovely voice. He told me that he based his readings on the BBC version of LOTR. Perhaps if he comes by and reads these posts, he might comment a little further. It's very odd, having a book published. It seems a dream, really. A dream rushing towards me, and I, towards it. It's the oddest, oddest, ODDEST thing! Ohhhhh, my heart was broken, and then gently reassembled. What a perfect way to celebrate this special day. thank you, SB! So glad you liked. The most heart breaking line in these two poems is: “I do not love you”. It shows that Frodo has really lost his soul and I feel he never got it back while in Middle Earth. “The Road, Taken” is a beautiful title for the book. It seems to symbolize both Frodo’s heroism and his tragic, inescapable fate. I’m very much looking forward to it. Thanks to you both for this beautiful post. you know, Ambree, I'm in such a different sort of place now than all those years ago when "Turning" was written. It's hard to find words for it, but I suppose it suffices to say that I lived in ME, every day, all day, or at least what the vision of it was for me when 'voicing' Frodo. But just as he received an education along the Road, and an additional education in TE, so I have come to see the World as a much larger place, full of impossibly deep darknesses, and even *moreso* full of light and laughter. It felt very strange to write "Cast Up" as a companion for "Turning". And yet so very, very right. As right as Frodo must surely have felt when he knew that he'd, in the end, been rescued. Thank you for coming by and reading. It means so very much. I must mention that the title was suggested by another lady (I hope she'll drop by this post) when I stiffed at coming up with one. She sort of riffed off of Frost's "The Road Not Taken"....but to me, it all is truly a riff off of Bilbo's road song, which speaks (the latter version at least) of, in the end, taking the hidden paths that run. Exactly what he and Frodo did. Bless their dear hearts. As always Frodo honors you, jan, by exposing his pierced and shattered heart and soul to you because he knows you honor him and he trusts you and knows it is safe to disclose such horrific defilement knowing you will not love him any less. Such a sacred relationship you two have. We are privileged that in his trust he does not fear his nakedness will lose the love of anyone else. I love also that the Sea reached him even there at the Mountain. God bless you and him and his guardian angel and the other angels who watched over him as he so faithfully carried out his calling and spent himself so utterly. Cannot wait for your book - autographed of course! :) I will order the moment I hear it is out! Thank you, mechtild, for posting this commemoration! Jan-u-wine does have a genius for bringing us as close as possible to the interior life of her characters. I am so pleased you stopped by, and I appreciate the thought and warmth of your comments, Antane. I can't wait for the book, either. And I'd like an audio-visual version of it, too, after watching and hearing the video clip in which John Cockshaw reads excerpts from the poems while his images are displayed, well-chosen music setting it all off to perfection. Hello again! It's me, Diem Kieu. Well... It's that time of year again to celebrate the anniversary of the Destruction of the Ring - and Sam and Frodo's heroism, of course! I will pass on your note to jan-u-wine. Actually, she wrote a lovely suite, "Suite: Road" of three poems in honor of March 25 this year. They reflect on life, death and immortality. Let me find you the link. You can find them in the blog of writer Laurel Hawkes, posted in succession on March 22, 23 and 24, the three days before the Fall of the Dark Lord. Have a wonderful Middle-earth new year! ... And they gave me the chills!!! Hope you had a happy Easter!! Hi Mech! Hope all is well with you and Jan! Well... it's another anniversary of the fall of Barad-Dur!! :D Wishing you the very best this 2017! Greetings, Diem Kieu! And a glorious fall of the Dark Tower to you. :) I am not bad, muddling through, just caught up with elder care and stuff like that. Thanks so much for stopping by and saying hello!